The Nikon 58mm ƒ/1.4G AF-S Nikkor lens is Nikon's latest fast prime lens and the spiritual successor to the famed Nikon 58mm ƒ/1.2 Nikkor Noct classic Ai manual focus lens. Boasting a slightly slower ƒ/1.4 aperture than its Noct "predecessor," it does keep the same focal length and lens element layout. This new 58mm lens is the latest additional to Nikon's growing collection of normal focal length prime lenses, joining the ranks amongst two pairs of 50mm ƒ/1.4 and 50mm ƒ/1.8 lenses -- both D and G model variants -- and even more 50mm lenses if you count the new 50mm lens for the Nikon Df and a 50mm ƒ/1.4 full-manual focus lens. The Nikon 58mm ƒ/1.4G lens is a high-end lens with 2 aspherical elements, Nikon's Nano Crystal Coat and a 9-bladed rounded aperture for excellent background blur ("bokeh"). Unfortunately, it comes with a very "high-end" price as well. The Nikon 58mm ƒ/1.4G AF-S Nikkor is currently available and ships with front and rear caps, lens hood and a soft case for around $1,700. Big thanks to our friends at LensRentals for sending us this lens to test! When not shot wide open on a full-frame camera, the Nikon 58mm ƒ/1.4G is a pretty sharp lens in the center. Unfortunately, at ƒ/1.4, it's quite soft and shows somewhat of an "upside-down sombrero" shape on our blur index chart. The center is somewhat sharp, but not overly so, a surrounding region out from the center is softer, followed by slightly sharper edges. On a sub-frame camera, it's not as soft relative to the rest of the frame at ƒ/1.4, but still not as sharp as we'd like to see from a $1,700 lens. Chromatic aberration is very well controlled on the new Nikon 58mm ƒ/1.4G lens. On a full-frame camera, CA is very low throughout the entire aperture range, with only a slight increase at the wider apertures (ƒ/1.4-ƒ/2). On a sub-frame, overall CA is also very minimal, however we did see a little more CA on our APS-C camera between ƒ/1.4-ƒ/2.8. Being a ƒ/1.4 lens, showing some vignetting is not surprising, and on a full-frame camera, the Nikon 58mm lens did show a fair amount of it, although it wasn't very severe. At ƒ/1.4, there was under 0.75 EV of light loss in the corners, which quickly dropped to under 0.5 EV at ƒ/2. Between ƒ/2.8 and ƒ/16, corner vignetting, while not eliminated altogether, was well under a quarter of a stop of light loss. 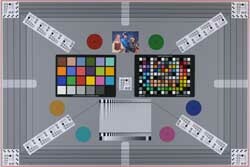 On a sub-frame camera, as expected, vignetting is greatly decreased thanks to the cropped image circle that comes from using a full-frame lens on an APS-C camera. At ƒ/1.4, vignetting was only around 0.25 EV of light loss in the corners and quickly dropped down to around a barely-noticeable 0.05 EV of light loss from ƒ/2.8-ƒ/16. It appears some vignetting was perhaps part of a deliberate design consideration by Nikon as they state on the lens' product page that "controlled light falloff retains natural brightness across the entire frame even at the maximum aperture" [emphasis ours] leading us to assume that vignetting seen when shooting wide open is to be expected. The 58mm ƒ/1.4G lens shows slight barrel distortion. On a full-frame camera, there's around +0.5% barrel distortion around the edges, and around +0.25% on average. Distortion is much less pronounced on sub-frame cameras; just shy of +0.2% in the corners and only around +0.08% on average. The electrical AF-S SWM (Silent Wave Motor) system on this lens takes about one second to rack from minimum focusing distance to infinity, but doesn't feel as fast as most lenses. The AF speed is not blazingly fast, but it's not slow either. It does, however, feel accurate and able to lock onto targets easily, as well as being very quiet as the "Silent Wave Motor" name would suggest. As with most lenses, there's manual focusing as well on the Nikon 58mm ƒ/1.4G lens. There's a physical M/A - M switch on the side to toggle from AF with manual focus override to full-manual focus mode. The focus ring rotates about 180 degrees through the full focus range, with soft stops at either end. With a close focusing distance of 0.58m (1.9 ft.) and a maximum magnification of just 0.13x (1:7.7 ratio), the Nikon 58mm ƒ/1.4G lens is not designed for macro photography. The Nikon 58mm ƒ/1.4G AF-S Nikkor lens is quite a large, wide (large in circumference, that is) prime lens, but manages to remain very lightweight. Compared to Canon's similarly-large but heavy 50mm ƒ/1.2L lens, for example, the Nikon 58mm ƒ/1.4G is very lightweight at around 383g compared to the 545g of the Canon lens. It feels very balanced and comfortable to hold paired with Nikon's larger DSLRs like the D800E or D610, but the lightweight design should make it nice to use on smaller DSLRs as well. 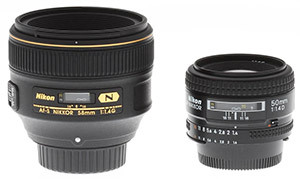 The size is a bit of shock when you compare it to other Nikon normal focal length prime lenses. 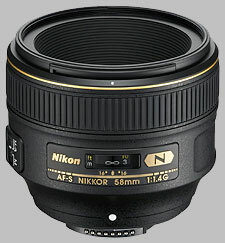 A Nikon 50mm ƒ/1.4D lens, for example, is practically dwarfed in comparison to the Nikon 58mm lens with it's large, wide diameter design (see below). The barrel feels to be constructed out of sturdy, polycarbonate plastic with a faint, speckled matte black finish and a metal lens mount. Nikon does not give specifics on the barrel construction for this lens, however. Inside the barrel sit 9 lens elements in 6 groups with two being aspherical elements. 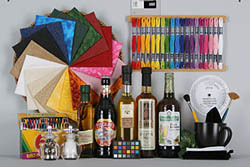 The lens has a 9-bladed circular aperture for excellent background blur. The lens also features Nikon's Nano Crystal Coat to help reduce flare and ghosting. As with other prime lenses, the exterior design of the 58mm ƒ/1.4G lens is very simple with a single focus ring, a small focus distance indicator window and an autofocus/manual focus toggle switch. The focus ring is about 5/8th of an inch wide with a nice, soft ribbed rubber texture for a secure grip, and is very smooth and easy to rotate. The included bayonet-mounted lens hood is also quite large and adds a little less than 2 extra inches to the overall length of the lens. If you can find one on the used market, the closest competitor to this new lens is the old Nikon 58mm ƒ/1.2 Nikkor Noct lens, on which this model seems to be based. It keeps the same focal lens, lens element layout, and a 9-bladed aperture diaphragm, but it has a slightly wider ƒ/1.2 aperture for even "creamier bokeh" and better low-light performance. The downsides are numerous, however, as it's manual focus only, out of production, and now somewhat of collector's item that sells for $3,000-$4,000+ used. A more practical alternative would be the the simple nifty fifty Nikon lenses, in either the 50mm ƒ/1.4G or 50mm ƒ/1.8G varieties. The Nikon 50mm ƒ/1.4G is smaller, lighter, much less expensive (~$400) and a bit sharper than the 58mm lens (particularly corner-to-corner at the smaller apertures). This lens, however, show much more vignetting on a full-frame camera compared to the 58mm lens. The Nikon 50mm ƒ/1.8G, on the other hand, is the least expensive at only around $200 and is not all that bad when it comes to sharpness. When stopped down, it's actually very similar to the 58mm in the center. It also shows a similar level of vignetting, but slightly more chromatic aberration. Wide open, the 50mm ƒ/1.8 lens is average on sharpness, and pretty similar to the 58mm lens. Overall, the other alternatives look to offer fairly similar performance in terms of sharpness, distortion and vignetting. Perhaps there are qualities of the Nikon 58mm lens such as local contrast and flare, which are things we don't test for, that it greatly excels at compared to these other lenses. The addition of the Nano Crystal coating to this new lens should help with flare as well as contrast. Overall, the Nikon 58mm ƒ/1.4G AF-S Nikkor is a bit of a strange beast. Compared to its 50mm cousins, the 58mm ƒ/1.4G lens is very large and very expensive. And despite the very high $1,700 price tag, we found the image quality results a bit disappointing for a lens at this price point. Wide open, the lens is not very sharp, even in the center, although it manages to show some impressive center sharpness when stopped down (and especially on a sub-frame camera). On other optical characteristics, the 58mm ƒ/1.4 does display some favorable results with very low CA and distortion, though there is some vignetting at the wider apertures (perhaps that's a deliberate design choice by Nikon, though?). However, given that this new lens is more than four times the price of the Nikon 50mm ƒ/1.4 with only an 8mm increase in focal length and not much improvement in image quality, we find new Nikon 58mm ƒ/1.4G lens a bit of an odd addition to Nikon's lens lineup. I got my hands on one of the Nikon 58mm f/1.4g lenses. Check out some sample images and advice here.